SEA, AIR, LAND & SPACE! The perfect watch for every dimension! 1. P-38 Lightning™ Chronograph, 9441 (44 mm, stainless steel brushed case). A tribute to Lockheed Martin’s legendary twin-boomed WWII Fighter Plane. 2. SXC Steel GMT, 5127 (45.5mm, black PVD plated stainless steel case). Preferred timepiece of SXC Astronauts and Test Pilots. 3. Field Valjoux Automatic Chronograph, 1861 (48mm, stainless steel case). Preferred timepiece of automotive enthusiasts. 4. Scott Cassell Deep Dive Automatic Special Edition,1526 (44mm black PVD steel case).Preferred timepiece of Professional Diver Scott Cassell. 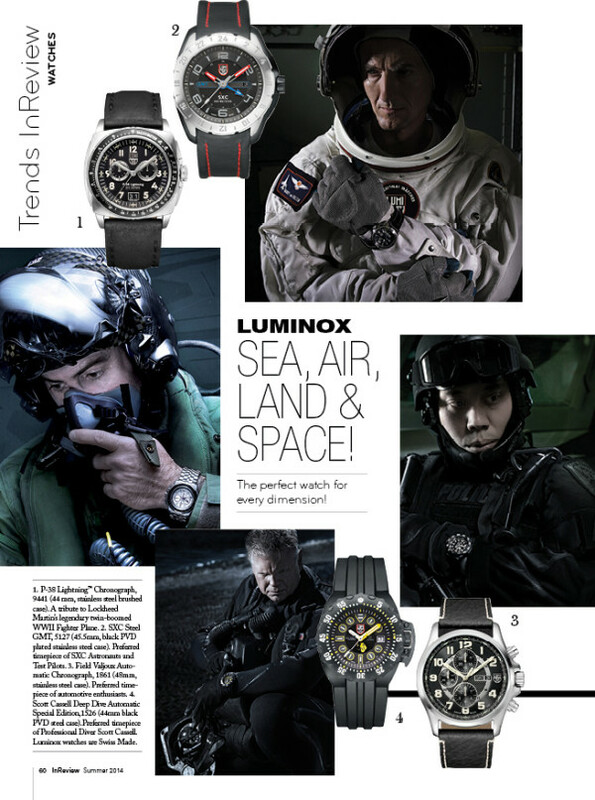 Luminox watches are Swiss Made.